Standout food resort amenities and a prime location for work and play earn the Hyatt Regency La Jolla high marks from our guests. 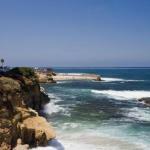 Set on 11 prime acres Hyatt Regency La Jolla isn't just a place to stay â?? for many it's a vacation destination unto itself. Offering 419 rooms and suites on 16 floors the hotel has much to satisfy. Rooms are equipped with 42-inch HDTVs iPod docking stations and extra-thick signature pillowtop beds. Amenities include a 24/7 fitness center and an outdoor stretching area with resistance bands and yoga mats. There's also a Junior Olympic-size heated outdoor lap pool with individual cabanas bar fire pits and a hot tub as well as lighted tennis courts. Self- and valet parking are available for an additional fee as is Wi-Fi. The hotel is conveniently located just off I-5 in a vibrant college/commerce area shouldering the UCSD campus. You can walk to the area's upscale restaurant row in five minutes or make the straight shot to quaint downtown La Jolla in 10 minutes. Torrey Pines Golf Course is about a seven-minute drive and attractions like San Diego Zoo and Legoland are a 20-25-minute journey. San Diego International Airport is 14 miles south of the hotel.